A stable thumb is essential for pinch and grasp movement. The ulnar collateral ligament (UCL) is located in the metacarpophalangeal (MCP) joint where the thumb meets the hand. Ligaments are soft tissue structures that connect two bones to make a stable joint. The purpose of the UCL is to keep the thumb stable in order to grasp objects. A thumb sprain is an acute injury to the UCL ligament in the thumb. An injury to the UCL can be painful and weaken the ability to grasp items between the thumb and the index finger. The ligament can be partially torn, completely torn, or stretched and may include fractures of the bones of the thumb. Thumb sprain injures are caused by accidents or falls. A thumb sprain is also called a skier’s thumb and frequently happens during skiing accidents when a person falls and doesn’t let go of the ski pole or lands on an outstretched hand. The thumb is jerked away from the index finger. Skier’s thumb accounts for about 50% of hand injuries in skiers. 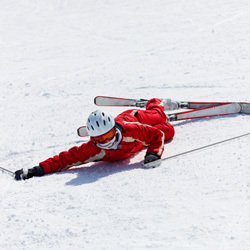 It is the most common upper extremity ski injury. For skier safety tips go to the Skier Safety Tip blog. Another term for sprained thumb is gamekeeper’s thumb, which is the result of a gradual injury to the UCL due to repetitive trauma to the thumb. Treatment can be more challenging for gamekeeper’s thumb because the gradual thinning of the UCL makes it difficult to reattach when torn. A sprained thumb is often ignored with hopes that it will heal. If this ligament injury is not diagnosed and treated properly, it could lead to chronic instability, weakness and arthritis. A DOC orthopedic specialist should examine the injured thumb as soon as possible after the injury to ensure the best outcome. Partial UCL tears typically require immobilization with a splint or cast for four to six weeks. If the UCL is completely torn surgery is usually necessary. The DOC surgeon will reconnect the ligament to the bone by making small incisions. If there is a bone fracture, pins may be inserted for proper alignment. A brace or cast stabilizes the thumb during healing for six to eight weeks.